From box CP/CENT/COMM/01. 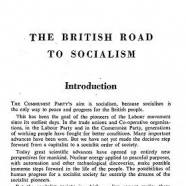 FILE 04: Minutes of meetings of the drafting Commission on the British Road to Socialism, August - October 1956. -- FILE 05: Mainly duplicated copies of draft sections of the BRS circulated to members of the Commission, with some handwritten notes, list of Commission members, 1956-1957. -- FILE 06: Duplicated copies of draft sections of the BRS circulated to members of the Commission, 1956-1957. -- FILE 07: Amendments proposed by the EC to the 1957 draft of the BRS; draft EC report to congress on the new draft, 1957. -- FILE 08: Comments and correspondence relating to the amendments proposed by the EC to the 1957 draft of the BRS, 1956-1957. -- FILE 09: Amendments to the draft version submitted by party organisations, 1957. -- From box CP/CENT/COMM/02 (currently unavailable). FILE 01: Amendments to the draft version submitted by party organisations, 1957. -- FILE 02: Amendments to the draft version submitted by party organisations, 1957. -- FILE 03: Amendments to the draft version submitted by party organisations, 1957. -- FILE 04: Amendments to the draft version submitted by party organisations - file passed over to Emile Burns by George Matthews, contains some correspondence, 1957. -- FILE 05: Correspondence with individuals (mostly representing party organisations) on the draft BRS and amendments thereto, 1956-1957. -- FILE 06: Report to the 25th congress on the work of the BRS commission, and post-congress correspondence with individuals and party organisations on the re-drafting process, 1957-1958. -- FILE 07: Draft sections used in the post-congress revision of the BRS, and supporting papers. Duplicated version of re-draft with annotations by Emile Burns, 1957-1958. -- From box CP/CENT/COMM/03. FILE 01: Materials for the final re-draft of the BRS, with notes and annotations by Emile Burns, 1958. -- FILE 02: Emile Burns' report to the EC on the final redraft of the BRS, 1958. CP/CENT/COMM/01/04: Minutes of meetings of the drafting Commission on the British Road to Socialism, August - October 1956. CP/CENT/COMM/01/05: Mainly duplicated copies of draft sections of the BRS circulated to members of the Commission, with some handwritten notes, list of Commission members, 1956-1957. CP/CENT/COMM/01/06: Duplicated copies of draft sections of the BRS circulated to members of the Commission, 1956-1957. CP/CENT/COMM/01/07: Amendments proposed by the EC to the 1957 draft of the BRS; draft EC report to congress on the new draft, 1957. CP/CENT/COMM/01/08: Comments and correspondence relating to the amendments proposed by the EC to the 1957 draft of the BRS, 1956-1957. CP/CENT/COMM/01/09: Amendments to the draft version submitted by party organisations, 1957. CP/CENT/COMM/03/01: Materials for the final re-draft of the BRS, with notes and annotations by Emile Burns, 1958. CP/CENT/COMM/03/02: Emile Burns' report to the EC on the final redraft of the BRS, 1958.